Chinese polar explorers have become the first people to reach the summit of the highest icecap in Antarctica, Dome A, planting their flag there at 3.16 am Beijing time Tuesday. Qu Tanzhou, director of the Chinese Arctic and Antarctic Administration, said the 12-man expedition had been working for several days to pinpoint the exact location of the peak. They have recorded it as 80:22:00 degrees south latitude and 77:21:11 degrees east longitude, 4,093 metres above sea level. An automatic weather observatory that uses satellites to transmit signals has just been built near the Dome A summit after the 12-man expedition reached the area on January 9, Qu said. The expedition has drilled through the ice 100 metres down and will collect samples to study. The explorers will stay in the area for 10 to 15 days and then return to their base at Zhongshan Station on the southeast coast of Antarctica, where they embarked on December 14, 2004 and covered 1,200 kilometres inland. Another important task for the expedition is to choose a site for China's permanent research station in the Dome A area, a project planned for the 11th Five-Year Plan (2006-10). China has already built two research stations, the Great Wall Station and Zhongshan Station, but neither of them is located in inland Antarctica. Far away from the coastline in inland Antarctica, Dome A has a rigorous climate and a dangerous reputation. It has been named "the inaccessible pole." 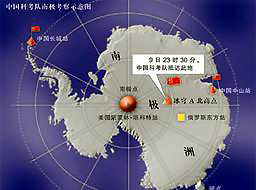 The Dome A Inland Icecap Programme was the primary mission of China's 21st Antarctic expedition, which started from Shanghai on October 25, 2004. China had made four expeditions to Dome A before this, with the third in 1999 covering 1,176 kilometres and coming closest to Dome A.